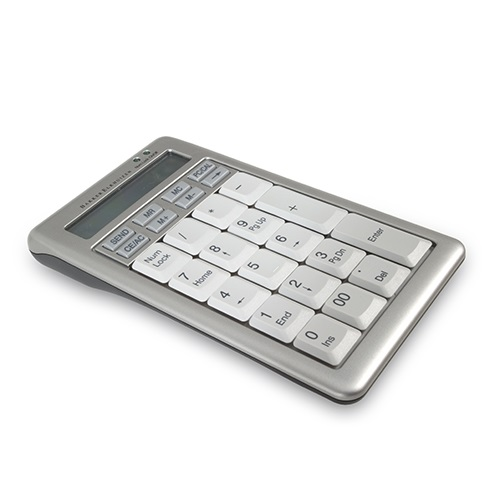 The S-board 840 Design Numeric pad USB. Research Scientific findings Compact keyboards (with separate numeric key section) decrease the reach distance to the mouse (Cook, et all, 1998), and decrease the strain for the underarms and are more comfortable than standard keyboards (van Lingen, et all, 2003). Health & Safety Regulations The distance between the keys should be between 18 and 20 mm (ISO 9241).The alpha numeric keys of the keyboard have to be separate from the function keys (ISO 9241).Dark keys on a light colour background make reading easier and increases productivity (Snyder, 1990).The middle row of the keys may not be higher than 30 mm, measured from the desk (DIN 2137). The keyboard should have the ability to tilt and be separate from the screen so as to allow the worker to find a comfortable working position avoiding fatigue in the arms or hands.